The digital reconstructions shown here were provided by Learning Sites to the Institute for the Visualization of History for its comprehensive, online educational and research module Digging Jerusalem: gateway to history, the Bible, and beyond. All the gateways depicted here were built under the direction of the Ottoman Sultan Suleiman the Magnificent between 1537 and 1541/42 (most rest on much older foundations). 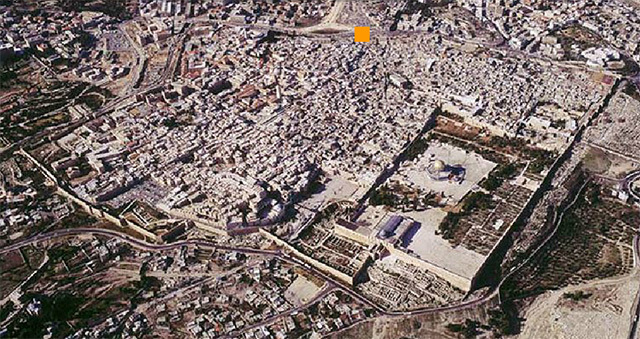 The Damascus Gate is located on the Old City's northern wall (see the screen grab at the left from the Digging Jerusalem online module; used with permission; hover over to enlarge). It is so-named because the road to Damascus used to begin here. Since the same route leads through the town of Nablus, the structure is called the Nablus Gate (Sha'ar Shekhem) in Hebrew. The gate's Arabic name, Bab el-Amud or Gate of the Column, is a remembrance of a column from the Byzantine Period that once stood near the gate as a landmark. The gate leads now into the heart of the Muslim quarter's bazaars. 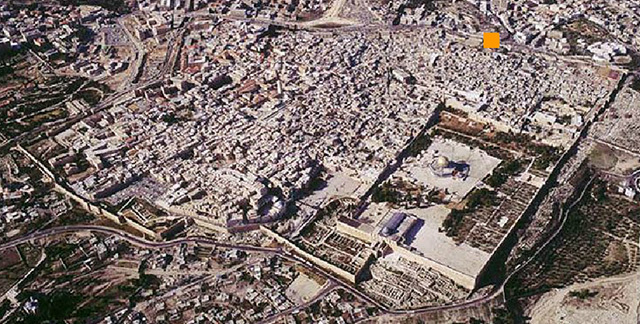 The current Damascus Gate is one of the best examples of Ottoman architecture in the city (see the view at the left; image © and courtesy of Donald H. Sanders; hover over to enlarge). 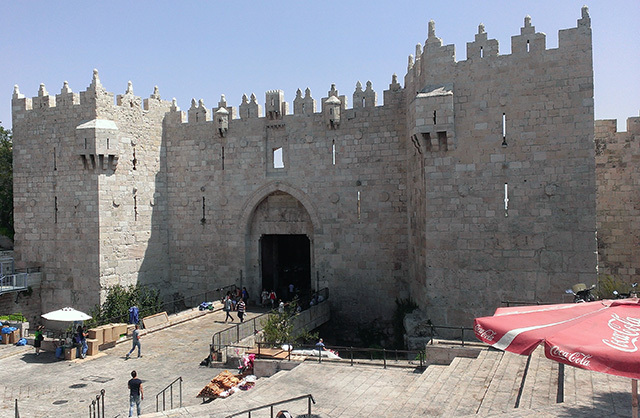 It is the busiest, largest, and most magnificent of all Jerusalem's gates and adorned with many turrets. The gate was built on the remains of an earlier, Roman entrance. Herod Agrippa I built the first gate (c. 41 CE), which was then rebuilt by Hadrian during his building of the capital city he named Aelia Capitolina. The Hadrianic gate (c. 135 CE), uncovered by Kathleen Kenyon's excavations below the present gate, can still be seen and visited. Herod's Gate started as a mere wicket opening in the wall designed to ease the flow of traffic on the northern side of the Old City's walls, east of Damascus Gate (see the screen grab at the left from the Digging Jerusalem online module; used with permission; hover over to enlarge). The Ottoman entry no longer retains its original defensive L-shape, as the gate became a direct entry into the city during the British Mandate. The gate is called in Arabic Bab ez-Zahra or Flowers Gate due to the ornamental flower engraved above the entry. It is called Herod's Gate, because Christian pilgrims of the 16th and 17th centuries thought that a structure near this gate (now identified as a house built in the Mamluk Period, c.1250-1517) was the former palace of Herod the Great. Although the early pilgrims were incorrect, the name has stuck. The irregular line of wall between this and the Damascus Gate indicate that the wall was built upon and following the ancient Roman walls of Hadrian's city, Aelia Capitolina. The Jaffa Gate is the main entrance into the Old City. This gate on the western side of the Old City marked the end of the highway leading from the Mediterranean port city of Jaffa (see the screen grab at the left from the Digging Jerusalem online module; used with permission; hover over to enlarge). The name in Arabic, Bab el-Khalil or Hebron Gate, is a reference to the connecting road to Hebron and to Abraham, who is buried in Hebron. Once protected by a heavy wood and iron door, Jaffa Gate's entry was strategically built and retains its original L-shaped interior (as can be seen the photo at the left; image © and courtesy of Donald H. Sanders; hover over to enlarge), an ancient defensive method of slowing the advance of enemy armies through the gate and forcing a turn that exposed their unshielded side to defenders. Once inside the walls, the road now leads directly into the western part of the Arab bazaar, or south, into the Armenian quarter. Near the southwest corner of the gate is where the Romans breached the wall in 70 CE. In 1898, Sultan Abdul Hamid tore down part of the city wall (as can be seen in the photo at the left; image © and courtesy of Donald H. Sanders; hover over to enlarge) and filled in the Crusader moat of the Citadel, when Kaiser Wilhelm II of Germany visited Jerusalem. The ruling Ottoman Turks opened this new passage so that the German Emperor would not have to dismount his carriage to enter the city. It was also through this gate that the British general Edmund Allenby led his troops into Jerusalem when they captured the city in 1917, towards the end of World War I. When the Old City fell into Jordanian hands in 1948, the Jaffa Gate was locked and walled in. Following the Six Day War in 1967, it was reopened and restored. 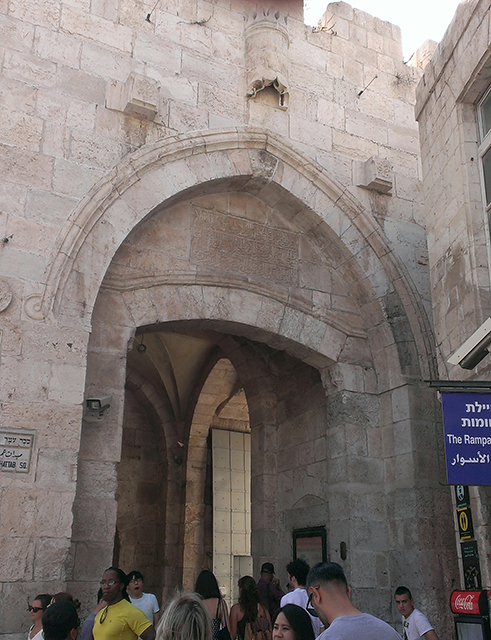 Located on the eastern side of the Old City (see the screen grab at the left from the Digging Jerusalem online module; used with permission; hover over to enlarge), the Lions Gate derives its name from the double pair of lions carved on either side of the entry arch. According to legend, as a result of a dream, Sultan Suleiman had the figures of the lions placed near the entrance, because he believed that if he did not construct a wall around Jerusalem he would be killed by lions. The gate is known as St. Stephen's Gate by Christians who believe that the saint was stoned to death here. In Arabic, the gate is named Bab el-Maryam, since according to Arab belief, the Virgin Mary's birthplace is located inside. 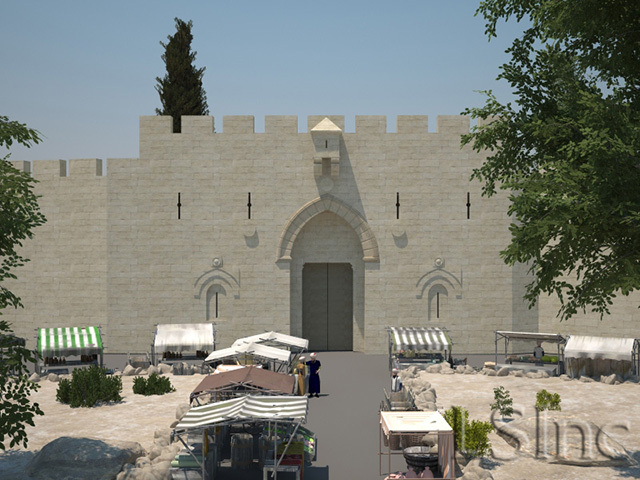 During the Ottoman period, this gate was called the Bab el- Ghor or the Jordan Gate, because it fronted the road to that country (see the rendering of the exterior of the gate at the left from the Learning Sites 3D model reconstruction; hover over to enlarge). 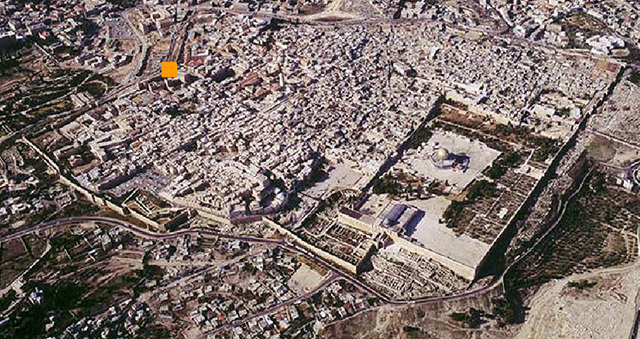 Situated at the southwestern corner of Jerusalem's Old City (see the screen grab at the left from the Digging Jerusalem online module; used with permission; hover over to enlarge), the Zion Gate faces the adjacent Mount Zion, for which it's named. The gate retains its original L- shaped defensive entryway. It provides direct access into the Jewish and Armenian Quarters from areas outside of the Old City. This gate is called Bab en- Nabi Daoud in Arabic, the Gate of the Prophet David, because of the traditional location of David's tomb on Mt. Zion. During the medieval period it was called the Gate of the Jewish Quarter. 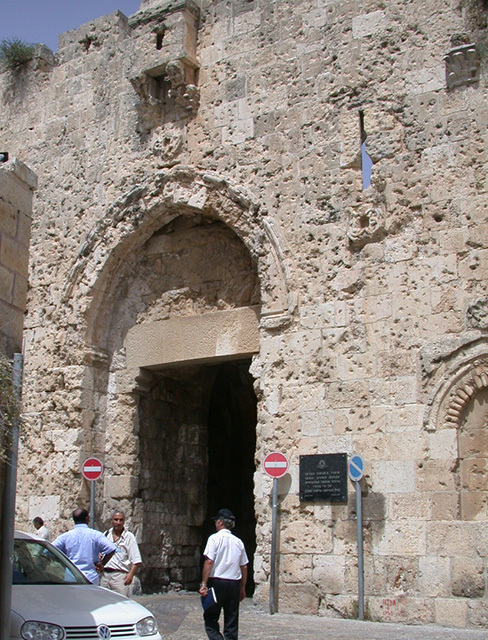 The many bullet holes riddling the exterior of the Zion Gate are a result of the heavy fighting that took place here during Israel's War of Independence in 1948 (as can be seen in the photo at the left; image © and courtesy of Donald H. Sanders; hover over to enlarge). 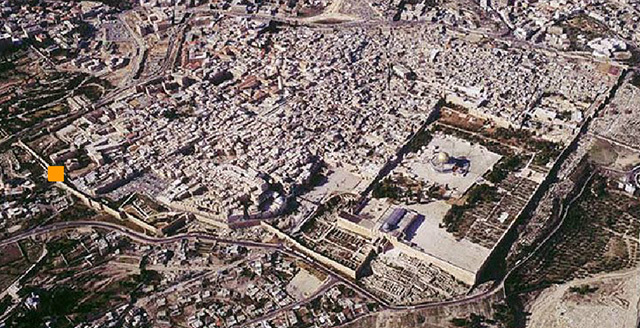 2000 "Excavations at the Damascus Gate, 1979-1984," pp.281-86 in Hillel Geva, ed., Ancient Jerusalem Revealed. Jerusalem: Israel Exploration Society. Reprinted and expanded edition.